The Palace of Holyroodhouse is home to the Queen when she visits Scotland, and contains an exhibit of Mary, Queen of Scots’ chambers. Built in the 1530s, the tower on the left is the oldest part of the palace (Mary’s chambers are on the 2nd floor). The tower on the right was refurbished in the 1670s. Most of the tour of Holyroodhouse takes you through rooms that are used today when Queen Elizabeth II is in residence. I picked a great time to go, because the Queen was expected to be in Edinburgh the month after. If you’ve ever wanted to see what a royal table setting looks like, you won’t be disappointed. But, that wasn’t why I was excited to visit. 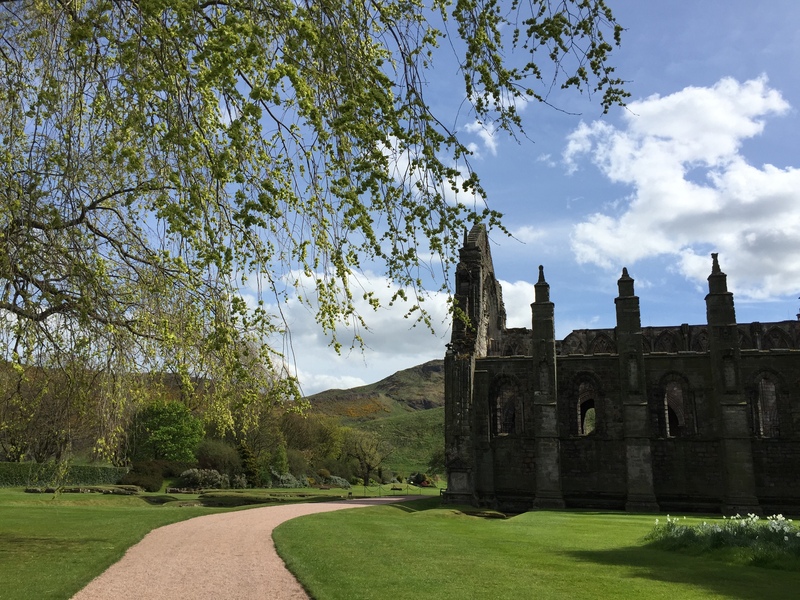 The real reason why you should visit Holyroodhouse is the bedchamber of Mary, Queen of Scots. Absolutely incredible. You enter her chamber by ascending a narrow, spiral staircase made of stone from the rooms below, which at the time would have belonged to Lord Darnley, her 2nd husband. 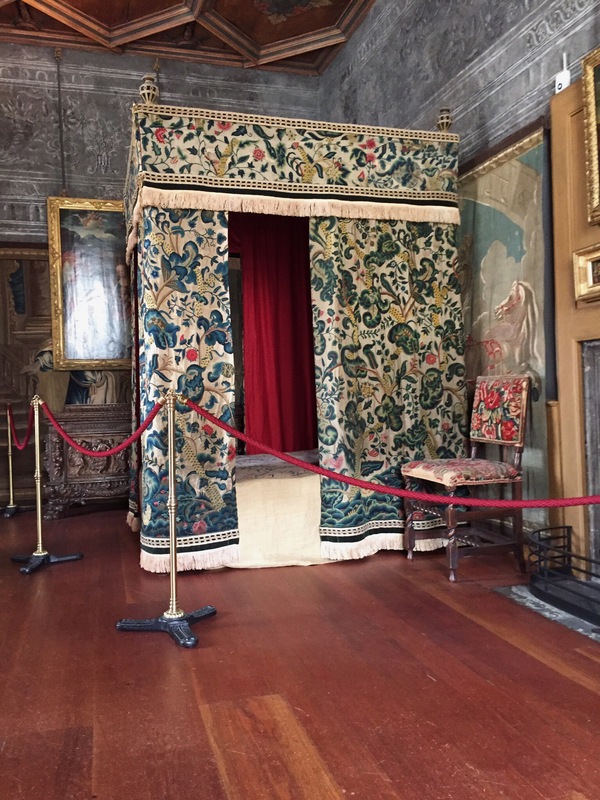 As you pass under the tapestry into the bedchamber, you can see a small room directly to your right, and another doorway at the far left corner of the room. The bedchamber of Mary, Queen of Scots. There was no flash used for this photo, I was sitting in front of a window. You can see in the picture above how they have painstakingly restored the walls so that you can see the old wallpaintings, which I like to refer to in my head as ye olde wallpaper. 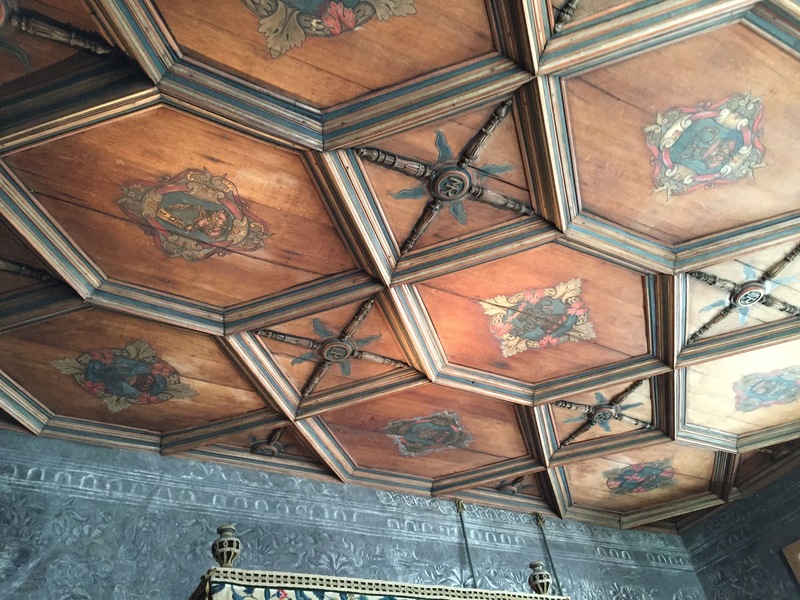 Seriously, the castles in Scotland have the most intricate wooden ceilings. No flash taken. Although it paled in comparison to her life at the French court, Mary absolutely loved Holyroodhouse. But it also was a site of a lot of pain, and the starting of a series of events that would ultimately lead to her beheading by her cousin, Queen Elizabeth 1. In 1566 her secretary (and rumoured lover) David Rizzio was dragged from Mary’s small eating room, through her bedchamber, and into the adjoining room by her husband Lord Darnley and his friends. Mary’s small eating room again, no flash taken. While one held a pistol to Mary’s pregnant stomach, they stabbed him 52 times. In the photo below, you can see where they left his body, and the plaque to commemorate the murder. The room now contains portraits of the Tudors and Stuarts, and objects that were in Mary’s possession during her time at Holyrood. The spot where Lord Darnley left Rizzio’s bloody body. No flash taken. I sat in Mary’s bedroom for about 25 minutes. I really wanted to take it all in and absorb everything, and really understand that I was in a place where momentous history had happened. It’s hard to find yourself in a historical place and to really understand where you’re standing. I’ve found in the past that I’ve moved through historical sites too quickly and only once I’ve left, do I realize that I didn’t fully comprehend what I was seeing. I found that I had greater success this time because while I was in Scotland, I set the mood by reading a biography of Mary. It really focused my information gathering on my trip, and I understood a lot more about the artifacts I was seeing than I would have if I hadn’t been reading. If you like fiction, I highly recommend Philippa Gregory’s The Other Queen, and for you non-fiction lovers, I am currently reading (and absolutely in love with) Elizabeth and Mary by Jane Dunn. It’s a fascinating biography that focuses on the two cousins and how their lives intertwined, rather than the usual historian-picking-a-side kind of thing you get in most biographies about these two women. So, after becoming friends with the kind man that was manning the Mary exhibit, I realized I should probably continue on and visit the Abbey. 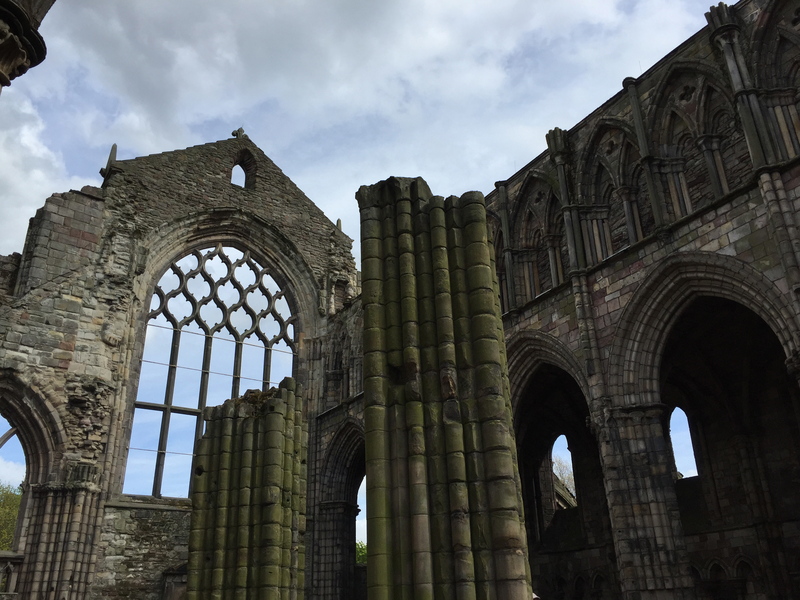 The remains of Holyrood Abbey are absolutely spectacular. 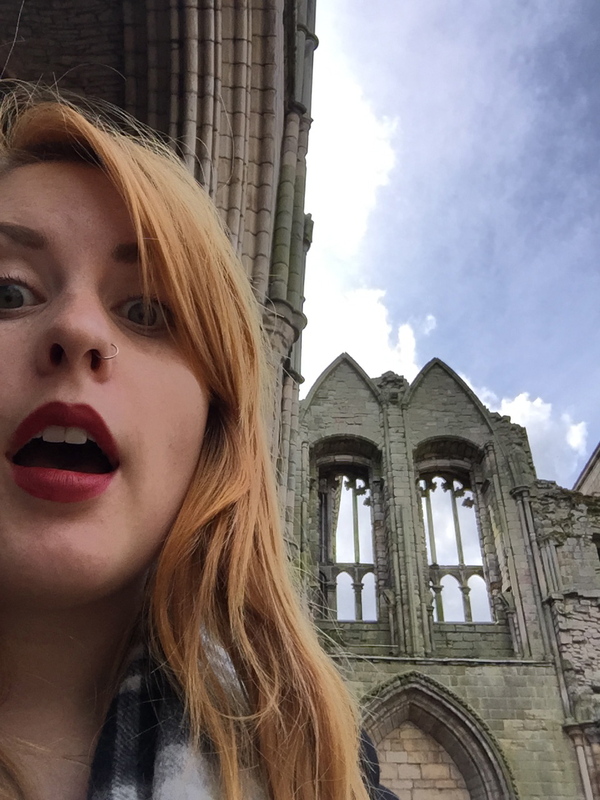 Seriously, one of the coolest ruins I’ve ever spent time in (and I am a fan of ruins). 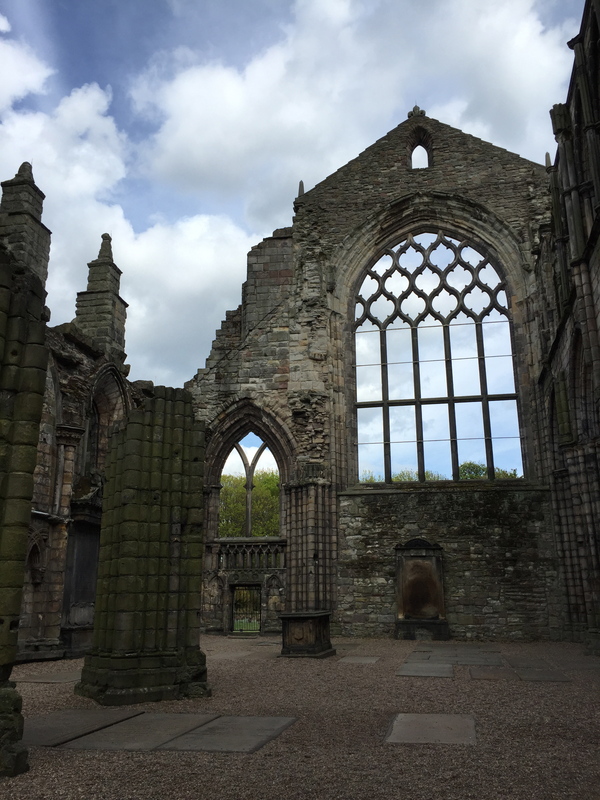 The remains of Holyrood Abbey . Those square ground stones are graves. 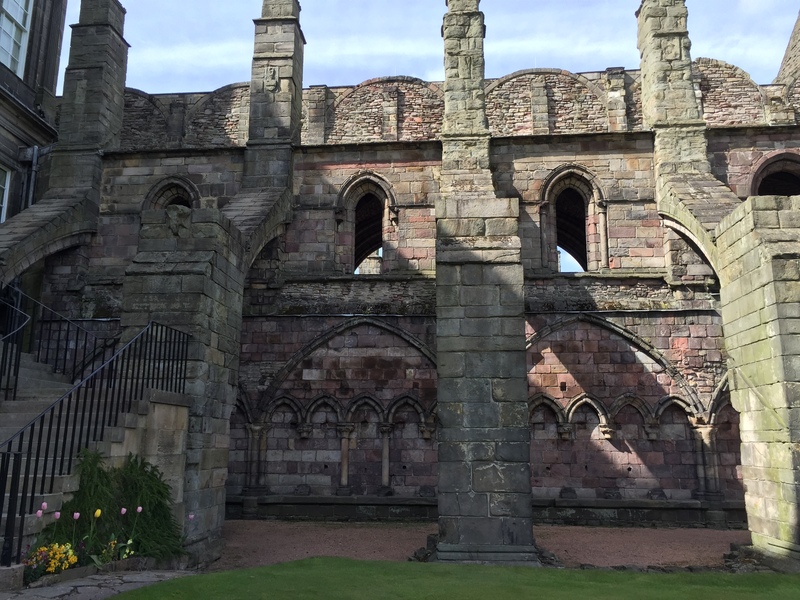 Built in 1128 by King David I as an Augustinian Abbey attached to the palace, it grew to be one of the largest monasteries in Scotland by the 1500s. The part that still survives is what would have been the nave of the abbey. Detail of the arches to the aisle of the nave. View of the abbey from the palace gardens. I loved these tiny tulips growing up next to the ruins. By the end of my visit, I got to be a boss at taking pictures without tourists in them. What are your tricks for taking undisturbed photos? Are you there God? It’s me, Beansie. Holyroodhouse is one of the most enchanting palaces I have had the good fortune to visit! I am quite jealous that you were able to take pictures in Mary’s chambers- the guide yelled at anyone who had a camera, flash or no 😦 Wonderful pics!! Thank you so much! It’s definitely a topic I feel super strongly about – I’m always very careful whenever I take pictures in a museum to respect the space, not use a flash, and not use my camera at all if it isn’t allowed. It may have been because I was using my iPhone and not a real camera, but I was chatting with the man that was working in the rooms so I assumed it was not an issue at the time. However, I’ve done some reading afterwards that people have had the same experience as you in the chambers, so I now feel conflicted about those four particular photos. I thought about deleting them but they’re already taken, so… I’m not sure. I guess it’s now my own moral conundrum 🙂 Thank you for your compliment though!